With Apple's WWDC 2018 developer conference getting underway on Monday, we're expecting an avalanche of news about iOS, macOS, tvOS, watchOS and more, and a new leak points to one of the iOS 12 upgrades – specifically, a new augmented reality feature. 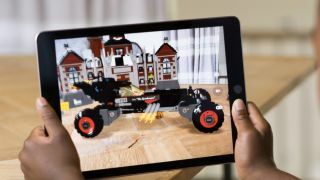 Apple debuted its ARKit augmented reality tool for app makers last year, and has since been pushing the iPhone as a powerful device for all kinds of AR trickery. Now Reuters reports that iOS 12 will introduce phone-to-phone AR – so two devices will be able to see the same scene, in sync, in augmented reality. The obvious use for this would be gaming, so you and a friend could battle AR dinosaurs or race AR cars around your coffee table, but developers will no doubt find a variety of ways to get this into their apps. According to "people familiar with the matter", data will be sent directly between phones to make this happen, so Apple won't be seeing scans of your back garden or living room. Apple itself is staying tight-lipped for the time being. Treat this as unofficial speculation for now, but we know Apple is keen on AR, and it's almost inevitable that iOS 12 is going to include some new goodies in this category. Having phone-to-phone AR available would make for a decent reveal at WWDC 2018, and probably lend itself to a cool on-stage demo too. Earlier rumors suggested iOS 12 would focus on stability and bug fixes rather than any huge new features, but we've also heard that the software update might let you unlock hotel doors with your iPhone, and help you stick to a responsible amount of screen time.